Welcome our members to the Genie & Master Alliance Page ! We would like to get the beasts for our alliance as fast as possible. 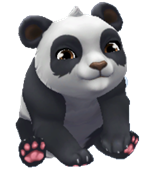 In order to make the pals donations more efficient and not to waste your pets, it was decided that all the pandas will be donated in Genie & Master alliance and all the owls will be donated in the dot. Anyone who has a panda to donate, please do it in G&M and then come back. Just ask for an invitation when you need to go there. Don't forget to post your answers on the forum on time and also funny answers as well to get some more gems.